TolkienBritta.com: Be Sure to Cast Your Votes in This Year's Dragon Slayer Awards! Be Sure to Cast Your Votes in This Year's Dragon Slayer Awards! The nominations are in – now it's up to you, the dedicated players, to vote for your favourite games/communities! The LOTRO fan base, who won the "Most Passionate Fanbase" title last year, has been nominated again! 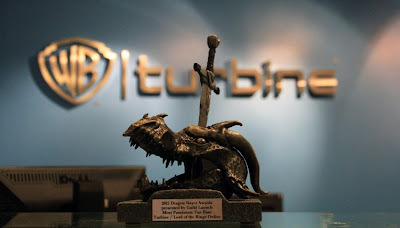 LOTRO's 2012 Dragon Slayer Award for Most Passionate Fanbase. Go show your support for LOTRO (and your other favourite games) by voting at GuildLaunch! You have until 2 September to do so, but why wait?